No Contracts- We are Month to Month! Large enclosure with timed light Perfect for a multi bedroom home, boat, or RV. Why Use Slipping J Storage? 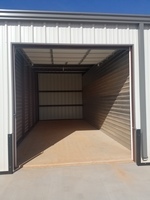 Slipping J Storage takes pride in offering a simple and hassle-free self storage experience for all of their customers in Harrah, OK. We make sure our storage units are clean, secure, and ready to rent. We also focus on offering a wide variety of storage unit sizes and types to make sure we can handle any self storage need that you may have. We offer a variety of sizes for mini storage as well. Slipping J Storage also offers online rentals and online bill pay 24/7 to make your experience a little more quick and easy. Feel free to look at our available storage units and give us a call if you have any questions or simply rent your unit right on the website. We are a locally owned business that supports our community.